I use amazon affiliate links within this post. Please consider buying through them if the product is of value to you and you find this post helpful. 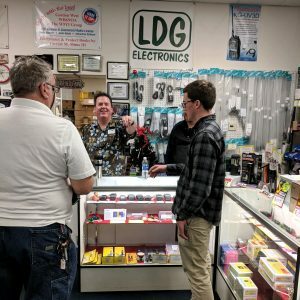 My wife and I recently had our first experience in a Ham radio store. 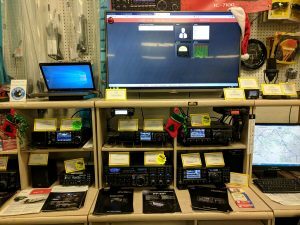 We went to Ham Radio Outlet (HRO) in Anaheim, CA. We weren’t sure what to expect since we arrived an hour before they close, but we decided to check it out. As we drove by I saw several huge antennas shooting up into the sky right over the shop. I noticed quite a few vehicles with two, three, four antennas each. These guys are really into ham radio! For whatever reason I was a little nervous to go inside, but when we did there was a salesman standing there with a smile. He greeted us with, “can I help you find anything?” I honestly wasn’t quite sure where to begin. 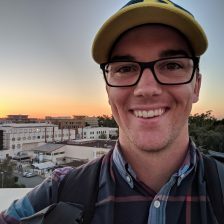 “I am studying electrical engineering, and I take my tech license test on the 30th. Should I take the general class test in that same day?” I could see the eagerness he had to help me find my way. After going through some basics he pulls out his little hand held radio to show us what you can do with just a tech license. Within less than a minute we hear a heavy Italian accent responding. He was in Northern Italy! They exchanged their names and brief facts about the signals and weather, then very politely ended the conversation. It was amazing! This demonstration was using the radio to talk with a repeater that then connects to the Internet, which broadcasts the signal on the chosen band to all the repeaters listening to that band. The Italian man was about 30 km from the repeater on his end. I was pretty blown away. While talking about general license privileges he walks over to a much larger radio and turned a few dials. Suddenly there were voices talking with each other in Chinese. It was amazing how easy he was able to make contact with people on the other side of the world. This radio didn’t use the internet at all. It was just the radio and an antenna. The YAESU VX-6R was his suggestion for a great starting out radio. It is rugged. It is waterproof and has a titanium body, so it is great for hiking. It uses a 1400mAh lithium-ion battery pack, which gives it around a 5 hour battery life. I loved the way it felt in my hand. After looking at the reviews and comparing it to other radios, I will probably be getting this as my first radio purchase. The TYT-MD-2017 is another route I am considering. It is about a $100 cheaper than the VX-6R and it has both analog and digital modes; however, the reviews are not exactly stellar, and you get what you pay for. The YAESU FT-857D is the next step up. This radio was really cool. Customizable display colors, HF, VHF/UHF, and more stuff than I know how to use at this point. It is small enough for mobile applications, yet powerful enough to reach the other side of the world. He showed us how it is setup in his car. I was amazed that you could make contacts on the other side of the world from the comfort of your car and not use the internet or cell towers. I liked the size of this radio and I am definitely considering it for my truck. It is the same radio as seen in this video demonstration by Diana Eng. If you have suggestions either way please let me know in the comments below. I’m still new to the field and I’d like as much useful info as possible. Thanks! John, I think the experience you and your wife had at HRO was pretty much the norm, and that’s a good thing. The salesman’s suggestion is quite sound; it’s easy to plunge in head first and become overwhelmed with ham radio. Take your time and develop a good foundation in radio and decide which direction you want to take your new hobby, as there are many ways you can go…the sky is no longer the limit once you’re a ham! Best of luck on the 30th – you won’t be a Technician for long. That’s great to hear. I’m looking forward to learning as much as I can during each stage. John, I am impressed with your article. When I got my Tech, I got a VX 6 and am very happy with it. Having just received my General endorsement, I am also thinking about the 857 as my next radio. I also have a Kenwood V71A Dual Band but if I get the 857D, it may replace the Kenwood. Glad to hear it’s a good radio. I haven’t seen many downsides to it yet. Thanks David! I’m glad to hear you enjoyed it.